If you ask Gun Garage owner, Mark Cole, a firearms related question, he’ll likely tell you that he has no idea. Then he will turn you over to one of his sales staff. You see, Mark is not a gun guy but he is a businessman who recognized that he had a prime location for a gun store…So he opened one up. The location? Performance Muffler & Performance Rhino Shop on the NW corner of Ali Baba & Dean Martin directly across the I-15 freeway from the Excalibur, Luxor, Mandalay Bay, and The Hotel here in fabulous Las Vegas, NV. Calling once again on his business savvy, Mark listened to his customer base who time after time suggested he open a shooting range too. Within 3 months, plans were underway to do just that. To make room for the new 12 lane 20 yard range, the contents of the entire garage had to be moved to the shop’s new location at 5370 S. Decatur. Considering the size and weight of some of the equipment used in an automotive garage, this was no small undertaking. Air compressors, welders, tool boxes, and the BendPak car lifts were all put on trailers and hauled out. Once the garage side of things was empty, tear down was necessary to remove some concrete block walls in order to make way for the new range area. For safety reasons, you can’t exactly build a gun range on the other side of garage doors. The doors were rolled up and the openings filled with rebar enforced and grout filled masonry block. Just before the final door was sealed off, all of the steel baffles, bullet traps, HVAC system, and other range components arrived. Parts of the garage floor were cut away in order to lay a solid foundation for the front wall which separates the shooting range from the lobby and viewing areas. The wall is built with the same materials that were used to fill in the garage doors plus 2 inch thick bullet proof glass was installed for your safe viewing pleasure. At the same time that the wall construction began, the ventilation system, shooting stalls, bullet traps, and everything else down range began to come together. A small t-shirt/souvenir retail section, waiting area, rest rooms, and the gun rental counter were built directly behind the retail gun store. Most of the counters are covered with themed graphics from AMR Racing. This entire area offers a great view of the gun range and has plenty of room for private parties as well as a few table tops built around the support beams. The range itself was designed and built by Action Target, a well known company who’s products can be found in a number of other Las Vegas shooting facilities as well as many other shooting ranges throughout the world. Gun Garage opted for a basic target retrieval system which sends the targets downrange on a set of cables and brings them back via the same. No confusing programmable options here, just a forward and back control and some lighting. The shooting stalls are all constructed of AR500 steel which protects the shooters next door from harm should there be any accidental discharges. At this time, 2 of the dozen stalls are equipped with video cameras and the company is working on installing a system which will allow them to deliver videos to those who want to remember and share their machine gun experience with others. Speaking of machine guns, all the usual suspects are accounted for as well as a few not so common offerings like a Kriss Super V. They also have a decent selection of handguns ranging from .22 caliber up to the almighty .500 S&W Magnum which isn’t so bad to shoot since after the 3rd round, your hand goes numb. ;) Shooting packages are available for people of all ages. The prices range from $40.00 up to $159.95 and include gun rental, eye & ear protection, targets, ammunition, and a T-Shirt. For those of you wanting more options, larger package deals can be negotiated. There are multiple gun ranges being built in Las Vegas right now but the Gun Garage was the first to cross the finish line opening their new gun range on January 6th, 2012 just before the 2012 Shot Show. In fact, with the show almost a month past, each of the other ranges are still dealing with construction and/or County inspections. Some of these other ranges were anticipating earlier openings and began booking reservations. This has created a good business opportunity for Gun Garage who graciously opened their doors for the “competition” and worked out a deal so their bookings did not have to be cancelled. Gun Garage will even arrange special hours for groups. Overall, this is a neat gun store and machine gun range centrally located in the Vegas valley. The staff are all friendly and excited about the future of the business. I enjoyed shooting there with my son. 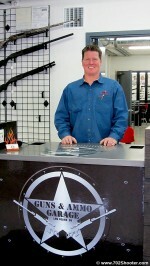 The staff is friendly and knowledgeable and they have a nice selection of firearms for use on the range. Mark is a nice guy as well! Good article! I shot there on Saturday and the range is very nice and the staff was very helpful and nice. Thumbs up for this range! I hadn’t heard of this place until recently, but it looks like a neat place, and I’m always up for shooting some guns! Looks great. Never knew this place existed before today. Gonna have to check it out. Terry, I’m moving in man. I need to live out there. My range limits my pistol mags to 5rnds per. Wish them all the luck in the future! Gotta love that. Hard to believe any gun related business would do that unless it’s mandated by local law. Well…. It was almost 50 last week haha. The -law- is 10rnd for civi. This specific range is strict. No rapid fire, 5rnd max, no silhouette targets, no unlicensed persons may fire anothers hand gun. They say it’s a state law, but I’ve talked to plenty of cops one of which is ATF and he said that they’re full of it. The only reason I can think of is that it’s a state park. Although I’m not aware of any strange regulations, I can say that a number of their employees are clueless when it comes to gun laws. Just because the State/County runs a gun related business does not mean they know WTF they are doing. Sounds good. I have been looking to try a range built by this company. I’ll have to stop by this weekend. I look forward to checking you guys out. need to check it out. i pass by it everyday after work. can’t wait to check this place out. Next week probably. I’ve dropped by a couple of times, the team is frendly and the prices are good. I’v heard about this range before and will be visiting them next week. I want in on this one too. No one can possibly pass up this opportunity! Any range time going full auto is special. Thank you Guns & Ammo Garage and 702 for putting this on! Just the obvious restrictions as far as indoor ranges and calibers. You can bring your own handguns but not your own rifles. Fees are in line with the other ranges in town but I do not recall them off hand. They are currently developing a new website as well as their range packages. I’ll send this question over to them and see if they can give more of a direct response on pricing. As 702 mentioned we have the “obvious” restrictions on handgun ammunition. No steel core, incendiary, armor piercing, safety slugs, dragons breath etc. Range time is $15/person and we have eye and ear protection rentals for $1 each. Even if I do not win, I will stop by to check out the range. Had no clue this place existed. I will definitely be visiting soon, thanks! Wow, I have to add this one to my list too! What’s actually being given away here? My wife loves Vegas, maybe now I can spend some money instead of letting her have all the fun. Looks like a great range. Well, I’ll probably never have the cash to blow on owning my own full-auto, but it would be neat to try! Next time I’m in Vegas, I’ll have to check y’all out. Not too far from Carter Powersports either. Sounds great, I have to check it out!. I read above you cant’ shoot your own rifles? Is this a law or company policy? Very nice facility. Can’t wait to check it out. I’ve dropped by a couple times. the guys are knowledgeable and cool. Haven’t tried the range yet. When I get to Vegas I will be looking into this for sure. My son would love it. I’m raising him like I was raised. To have respect for people and guns, and know how to handle both properly. I’m not too far from Vegas, next time I’m passing through I will have to check it out. Especially if I get to shoot machine guns for free! Any trip to Vegas is great, but if you can shoot select-fire also, that’s just icing on the cake. Looks like a good place to go and from what i hear its not too bad on prices either, going this weekend to check it out. We need a range like this near us! I wish California gun ranges were as cool as you guys…I wouldn’t mind visiting then who knows i might end up staying! lol. That sounds like a great set up for a couple of stores. I’ll be stopping in and bring one or two friends. Sounds great. I would love to visit. Wow! I worked for Mandalay Bay and you guys are just across the street for over a year and I didn’t know anything about G&A Garage until now! Thanks to 702shooter.com I can go and shoot my service firearm before I go to work! I know where I will be this weekend… Gotta go check this out…. Woot! I won. Looking forward to trying out the range and putting some rounds through the Kriss Super V. I’m always up for some full auto fun. Thanks 702Shooter and the team at Guns and Ammo Garage. This would be a very cool outing……. Will be in Vegas for my best friends wedding in Juy. This would be an awsome wedding gift for him and his new bride. Congratulations, Mark and good luck to ya. Everyone was very professional and friendly and great prices! NOW VEGAS OFFERS SOMETHING THAT I AM INTERESTED IN. Can’t wait to see it in person during my next trip Vegas. Thanks 702 for posting! I recently completed a two day AR15 Urban rifle class. I learned a lot and had a blast! Just finnished looking at all your range photos. You have a very impressive indoor range! I live within walking distance to our local indoor range (Kiffney’s in Key Largo, Florida). Yours looks amazing. Praying I get a chance to see yours in person this October. THINKING OF MOVING TO LV or Nevada so it will be good to have a quality dealer/range to use when I am in town. HOPE the business thrives in the coming days. Don’t know if I am entering too late for the giveaway or if there is another one on tap but hope so. If not its great to see a good shop in a great location. see you soon. I really wanna check out this store, and yet again I’ve never noticed it. But then again I also just moved back into the state. I stopped there by accident and was very happy I did. The staff was great and even if you don’t find anything to buy – the trip is worth it just to visit with the girls. I’m a local Las Vegas guy. springs and other AR parts. been more expensive because of the added shipping costs. some morons would bring in armor-piercing ammo, so I understand their hesitation. good staff and hot chicks at the indoor range, there’s no reason to shop anywhere else.